Joining us with a guest review today: Megan, from As Loyal as a Book! Megan is going to chat with us a bit about the quirky Choose Your Own (Austen) Adventure story, Lost in Austen, and I have to say, I agree with much of what she has to say. And yes, I know there's also a movie of the same name (and that people tend to love or hate it - I'm firmly on the love side! ), but no, the movie was not based on the book, so let's just get that potential-confusion out of the way, shall we? Oh, and bonus feature? Megan's made us an LIA bookmark to play along in the book. Score! How? It's entirely up to the reader. The journey begins in Pride and Prejudice but quickly takes off on a whimsical Austen adventure of the reader's own creation. 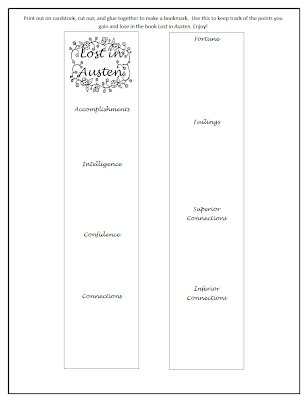 A series of choices leads the reader into the plots and romances of Austen's other works. Choosing to walk home from Netherfield Hall means falling into Sense and Sensibility and the infatuating spell of Mr. Willoughby. Accepting an invitation to Bath leads to Northanger Abbey and the beguiling Henry Tilney. And just where will Emma's Mr. Knightley fit in to the quest for a worthy husband? It's all up to the reader. Remember those choose your own adventure books? You know, the ones that have a choice at the end of each chapter where you had to go to one page for one choice, or another page for another choice? I had some when I was a child, mostly the Give Yourself Goosebumps series by R. L. Stine. I always thought they were so much fun since it felt like you were controlling the story. You’re probably wondering what this has to do with Jane Austen. 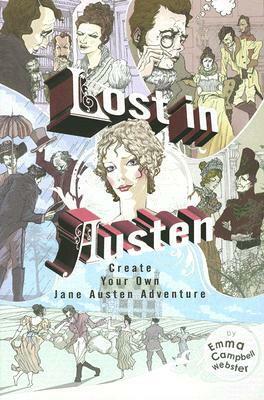 Well, there happens to be choose your own adventure books aimed towards adults, and there is one that is especially for Jane Austen fans. It is called Lost in Austen by Emma Campbell Webster. In this book, you play as Elizabeth Bennett and your goal is much the same as in the book Pride and Prejudice: marry well and for love. What makes this book different from the books that I had as a child is that you have the option of keeping track of points that you gain or lose throughout the novel. This is not a book that you read straight through and you may have to start over more than once. I will admit that with the first choice that I made, I failed miserably with a really ridiculous result. Face disfigured by a group of gypsies? For real? I have to say this made me angry because I didn’t really see it as something that would happen in a Jane Austen novel. It was just a little too over the top. But, I tried again. The second time around was much better, mostly because I tried to choose what Elizabeth did in the novel. This is what I didn’t like about this book. I wish the results of your choices would have deviated a little more from the original story. Maybe Elizabeth wouldn’t have been miserable with Mr. Collins and they would have ended up having a successful marriage? At times, I felt like this book was just a simplified version of Pride and Prejudice with a question or choice for the reader thrown in here and there. Often, it seemed like I went several pages without getting to choose the next step which was a little frustrating at times. But, I did enjoy this book for what it was: something fun to do and a chance to pretend that I was Elizabeth Bennett. If you love Jane Austen, this is a unique book that I think would be fun for you to check out! Ooh I remember this type of book, bit of fun! I think you should set aside the dislike of the ending (no Darcy and Lizzie? Darcy and someone else? BLASPHEMY! lol), and give the movie a try. Frankly, I LOVE it. It's clever, it's silly, it plays well to newbies and Janeites alike, and it actually makes some really interesting changes to the characters. I love 'choose your own' adventures. I had no idea there was an Austen one. Thanks for sharing Megan.